We begin a new trecena of “Light” that will Inspire a Dream to fulfill our Life’s Mission and Purpose. Deer/MANIK, also known as Hand, is a symbol of Human’s role as the Creator’s Divine Hand in the world. The MANIK glyph illustrates the hand that grasps the Ether of Spirit between the forefinger and the thumb. The thumb reflects the strength of the Human Will, the digit of our Authority. The forefinger (the pointer) represents a discernment of Direction. The Circle is the “eye of the Deer” that Vigilantly Observes the 4 Directions. By applying our Human Will and the Gift of Divine Discernment, we can be Connected to a Source of Divine Guidance. Our movement in the world can be directed by an Almighty Authority. Deer/MANIK is the Day Sign that holds every Spiritual Tool. MANIK helps us to see our Human limitations so that a Spiritual Tool is created to meet every need. As a Day Sign of the West, MANIK will call our Consciousness to our Experience of the Unknown. The more we are willing to see our weakness, the more we will be blessed with Spiritual Tools. Deer/MANIK’s most used tool is Vigilance. Deer stands silently in its own Truth, observing the landscape in all 4 directions. MANIK is said to uphold the Pillars of Consciousness in every direction of our life. Following the path of the Deer, we will learn many ways that we can Stand in our Own Truth, and uphold the Pillars of Divine Consciousness for the Whole. There are 4 Global Burner Days in the 260-day round of the Tzolk’in, a burner for each of the Seasons. Burner Days represent a release of residual energies… a clearing and purification. The Mayan priest performed the Sacred Fires that would draw the community back together into Right Relationship. On the days leading up to a Burner Day, we can experience the stress of too much energy. 4 Dog/OC holds potential for a release on the Tone 4 of Stability. See the 13-day Trecena Guide for more information. Portal days thin the veil to Spiritual Dimensions and elevate our Awareness to our own Spiritual Gifts of Intuition and Knowing. 13 Storm/CAUAC is the one Portal Day in the Deer/MANIK trecena. The Lightning of CAUAC connects Heaven and Earth, Body and Soul. A Portal will magnify a connection to “Lightning Energy” at our Ascension to a Higher Purpose. CIMI the Clairvoyant predicted a Miracle in our Future. We Ascended from the Jaguar/IX trecena on 13 Transformer/CIMI. CIMI gave us a Sign of Major Life Change in our future, a Change carried out by Divine Intervention. We will Know it is a Miracle, something we were Humanly incapable to do. 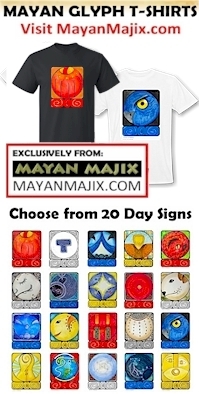 Deer/MANIK is the Day Sign of the Mayan priest. MANIK upholds the pillars of Heaven on Earth in service to the Whole. Under the Authority of the Creator the priest or shaman maintains a Holy Communion. The shaman and priest are dedicated to make Offerings at the Holy Altars, and performs Sacred Ceremonies for the Community as observed by the many Mayan calendars. The Mayan priests are the Miracle Workers who dedicate their lives to Remember for the Whole. They bring Unity through a commitment to the Intention of a Divine Authority, and the Vigilance of Consciousness to Divinely Discern their Direction. We are given the Freedom to Choose the way perform our own Rituals and Ceremonies. The Elders say that the traditions passed down are proven and worthy tools. These Spiritual Tools are shared with us to use until we discern our own Unique Way that would Honor the ways of our Grandfathers and Grandmothers. Deer is capable to push away bad influences and negative energy. The Deer holds the Power of Harmonic Resonance. Holding the Pure Vibration of Love, Deer attracts Love. Deer’s magnetic force pushes away opposing forces. MANIK will demonstrate the Power of Attraction. The Cherokee identified MANIK as the stag, the powerful one who stands on behalf of its community. When the stag moves, the community naturally follows along. When we demonstrate Love, others will learn to follow along. In the realm of Spirit, Truth is a mirror reflection of the Truth Human sees. In Spirit, our strength lies in not defending our Self. Convincing others to agree does not reflect the Inner Strength of Belief. Our Greatest Influence lies in Believing in the Creator’s Power to Transform Human Hearts and Minds. Under the guidance of the Deer we will feel the presence of Divine Protection. Deer is a Day Sign of the West, the direction of our Unknown Experience. As a Day Sign of Water, MANIK touches our emotions. Deer can draw our feelings of limitation to the surface for a Divine Purpose. We are given the Spiritual Tool to make us Whole. Representing the Element that holds the Ether of Spirit, MANIK offers a Baptism of Emotional Healing and Purification. Through our own Healing we will Grasp the Power of the Spirit. Our limitations will be Transformed into our Greatest Witness to the Power of Divinity. We will inspire others to Believe when they see a Power Beyond Human Explanation has changed our life. We will draw others to Spirit by the Power of Attraction. Deer/MANIK holds us to our Highest Standards. When confronted for a lack of integrity, Deer is tempted to be defensive and stubborn. The Truth of those in a position of Authority and Leadership is often challenged. We have no reason to defend our Truth, when our minds are open to Higher Truth. We won’t need to convince anyone of anything when they are inspired to Grasp the Power for themselves. Vigilance will be our Spiritual Tool for protection. Acting as the Hand of God, Deer must vigilantly uphold the Divine Intentions of Harmony, Equity, and Unconditional Love. Miracles are possible when Human upholds the Intention of Divine Justice. Deer/MANIK can teach us to stand firm, no matter what others think. Our Sacred Intention will return its own Divine Reward. 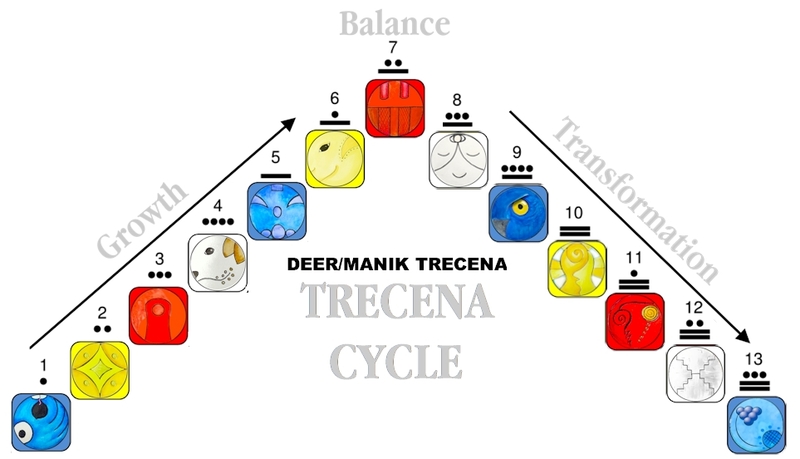 The Deer/MANIK trecena is a cycle of “Light.” Our Consciousness will be focused on incoming inspiration. The Deer will generate our Passion to Serve as our Life’s Mission and Purpose. To all my relations, may we be inspired to make a Choice of our own Will to serve as a Divine Agent of the Creator. May our Hearts be opened to a Divine Way that may appear contrary to our Human Mind of Reason. May we keep an open mind and have the courage to question what we believe. Where we see our own doubt, may we hold Faith in a Transformation of Belief. May we hold the Vigilance of Consciousness to be Witness of a Miracle that makes it possible to Silently Stand in the Integrity of our own Truth. MEDICINE NOTE: The Deer that live on my parents farm make their beds among the cedar trees. The smell of cedar offers a healing of emotions, promotes feelings of well-being and restful sleep. This is a good trecena to burn cedar or use cedarwood aromatherapy. If you haven’t tried it, a drop of cedarwood essential oil applied to the bottom of each foot before bed promotes a very restful sleep. The Elders say to Honor every Gift of Earth Medicine before it is used with thanks and appreciation, expressing the Intention that it be honored in a good and worthy way.